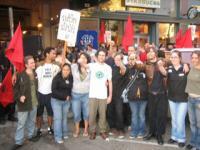 The IWW continue to organise Starbucks baristas in the USA. When Joe Tessone and his fellow Starbucks baristas walked into a pep rally with management at their store in Chicago’s Logan Square neighborhood in August, the bosses were ready. A trio of higher-ups passed around copies of the preamble to the constitution of the Industrial Workers of the World and warned the hourlies against the radicalism of the old anarchist-socialist One Big Union. The managers told the “partners”—the company’s sobriquet for a workforce that baristas say is entirely part-time—that the CEO and chairman carry the same benefits package as the baristas. The nation’s 71-year-old foundational labor document applies to all workers, not only those who can arduously prove a majority of their colleagues want a union. The baristas don’t want an election with the National Labor Relations Board (NLRB) or a certified bargaining unit. They’re using a tactic popular before the Depression, solidarity unionism, in which a minority of workers act in concert and issue demands even if management doesn’t recognize their union—which Starbucks does not. But the Chicago baristas aren’t alone: Six New York City Starbucks have affiliated with the IWW in two years of campaigning, and the Wobblies take credit for three city-wide pay increases there. Already in Chicago, where the starting wage is usually $7.50 an hour, the baristas have won safety improvements and scheduling changes. Aggressive anti-union tactics have become the norm in the United States, from no-holds-barred outlets like Wal-Mart to image-obsessed corporations like Whole Foods. Labor law is permissive of abuse, so much so that a landmark 2000 Human Rights Watch report found 24,000 workers fired for organizing in a year, just one symptom of what it called the “culture of near-impunity” governing management’s attacks on union efforts. The Bush administration has helped tip the scales further against novel efforts like the Starbucks union. The NLRB ruled in 2004 that nonunion workers can no longer accompany each other into investigatory meetings with bosses. Commonly known as “Weingarten rights,” they have been extended to and stripped from nonunion workers four times in the last 30 years. Solidarity unions often invoke them to document management’s browbeating and witness disciplinary investigations. Joel Rogers, a professor of law, political science and sociology at the University of Wisconsin, Madison, who has examined flexible forms of organization, says workers and unions shouldn’t focus on the NLRB but on finding ways to defuse intense employer opposition. For example, unions might invite workers who want changes in their work place but who haven’t won (or have lost) formal union representation to join the union and become involved. Another example retail workers can draw from is the Restaurant Opportunities Center of New York (ROC-NY), which has won six campaigns in five years against restaurant conglomerates in the city through a combination of direct action and lawsuits. The group—which is friendly with the hospitality union UNITE-HERE—brings together restaurant workers, many of who are undocumented immigrants, to resolve concerns about working conditions as well as to file class-action lawsuits. The Center has secured more than $300,000 in back wages and discrimination complaints, brokered managerial agreements to respect wage, hour and benefit laws, and opened a collectively managed restaurant of its own. Old labor is starting to listen. In August, the AFL-CIO signed an agreement with the National Day Labor Organizing Network, signaling new intentions to partner with a group labor embraced only six years ago. Although the estimated 118,000 day laborers won’t join or pay dues, the worker centers marshalling increasing numbers of the laborers can access some services, like the AFL’s pro-bono labor lawyers. The Wobblies, of course, have big plans of their own. Mischa Gaus is a freelance writer based in Chicago.